Dr. Ted Sun graduated with Bachelor Degree in University of Science and Technology of China (USTC) in 1993, with thesis work on discovery of new functional nano-materials. He pioneered the project in Lawrence Berkeley National Lab, on combinatorial synthesis and screening of various functional materials, which leads to over 20 US patents on the methods and new materials discovered. After obtaining Ph.D. degree from University of California Berkeley in 1998, he worked in GE Global research as project leader and senior staff scientist, and in Intematix as VP Phosphor Technology, before founding Superimaging in 2004 and Sun Innovations in 2007 in Silicon Valley. 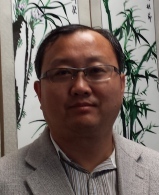 His research covers various areas of advanced materials and their applications, including solid state lighting, emissive projection displays, bio-medical imaging, thin film solar cells, anti-counterfeiting, etc. He is author of 18 peer-reviewed articles (3 in Science) and over 50 patents in United States alone (over 30 were issued). He is the Principle Investigator and recipient of numerous research grants and awards from various US federal agencies. The transparent display technology that he invented has won the prestigious annual award on global technology innovations – 2011 R&D 100 Award. Sun Innovations will present the first full-color, fully transparent emissive projection display (EPD). It comprises of 3 layers of novel transparent RGB-emissive nano-materials, which present bright full color HD-images by a patented “spectral selective excitation” process from a custom-built DLP projector. The paper-thin projection screen made from fluorescent nano-materials is clear to visible light, yet it blocks the projected excitation image from leaking through. The screen has pressure-sensitive adhesive to be readily applied to a glass panel of any size or shape. It can easily convert any clear glass panel to digital display without obstructing the view through the glass, presenting full color HD-video images with unlimited viewing angles. In the presentation, Dr, Sun will describe the latest developments and innovations of the emissive screen and the novel transparent HD-video projection system. As the ideal solution to readily convert any glass panel to a scalable optic-clear digital display, it can be widely used as full-windshield heads-up display (HUD) in various vehicles, as well as an innovative see-through digital signage solution on store windows.